It's a long way to the top but it is worth the climb! The way down is a steep drop that curves around to a splash pad for excitement. Is your school planning a water day? You'll want to add this giant water slide. It doesn't have a pool making this slide perfect for daycares and preschools that can't have standing water. 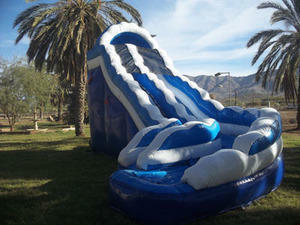 This giant slide is fun for teens, high school students and even adults.